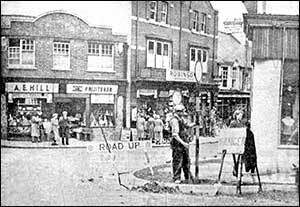 High Street and Newton Road, Rushden. and a “no waiting” sign is just going up. Note: This is known as "Ward's Corner"
In aid of the Fund for the Proposed Road across Yelden Fields. FULL PARTICULARS IN BILLS AND CIRCULARS. CONVEYANCES will meet the Trains at Higham Station, London and North-Western Railway.